A delicious way to use kefir! 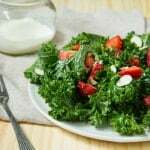 Kale and strawberry salad with kefir buttermilk dressing is a great salad to bring to your next picnic or cookout! Sorry I missed ya’ll earlier this week but I came down with a cold on Friday and then something very strange and bizarre happened – I woke up Sunday morning with the worst neck pain ever. Like hurts to move my neck no matter how small or big the movement. I tried to work through it on Monday (I convinced myself the more I move it, the more I’ll loosen it up) but then when the pain was still still there yesterday morning with no improvements, I decided it was time for a visit to the Doc. He said I have a muscle strain or muscle fatigue in the neck muscle that holds your head up (yeah, kind of an important one). He said it’s hard to say what caused it – I could’ve slept on it wrong or it could be fatigue that accumulated over time from sitting at a desk hunched over at my computer (yikes). And the treatment plan? Bed rest. Music to a type A personality’s ears. Not. So I laid in bed resting my neck all day yesterday and today I’m setting my alarm every 3 hours for scheduled “reclined rest and ice” breaks. Oh, and that cold? Still got it. Needless to say, it’s a trying week for me over here. Especially as I know I have travel for work coming up next week and my big trip to Europe in less than two weeks. Hoping I can rest as much between now and then and be back to normal in time for it. Despite the neck pain, I didn’t want to leave ya’ll hanging on the recipe front this week. Especially since I made a bomb salad last week inspired by an article I recently wrote for TODAY on kefir. Have you tried kefir before? It’s tart and tangy like yogurt but thinner so you can actually drink it. I personally like to drink it plain but if it’s too tart for your tastebuds you can blend it with fresh fruit to sweeten it up. Kefir is pretty awesome because it’s packed with more probiotics (good gut bacteria) than yogurt – typically 3x as much – and that means more good bacteria to help restore your digestive system. When writing this article on kefir, I realized I needed to step up my kefir game in the kitchen and start using it in more dishes. You can use it like you would yogurt – in baking, dressings, sauces, and frozen treats. Read the full article to see just how creative you can get with this fermented milk beverage! Strawberries on a salad is always a good idea to get more fruit onto your plate. But it’s an especially good idea now as strawberries are in their peak season. Whisk kefir, honey, olive oil, lemon juice, garlic, parsley, and salt together until combined. 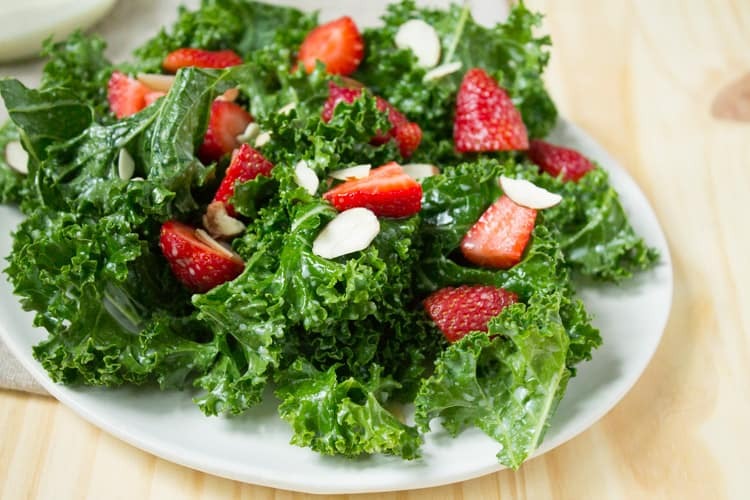 In a medium bowl, add dressing to kale and massage kale for two minutes, or until leaves are softened. Toss in strawberries and almonds before serving. Tell me, have you ever used kefir in the kitchen before? Just in time! I am getting more kale this week in my CSA. What a pretty salad! Can you believe I still haven’t tried kefir? Don’t know what’s holding me back! Hope you’re better asap! 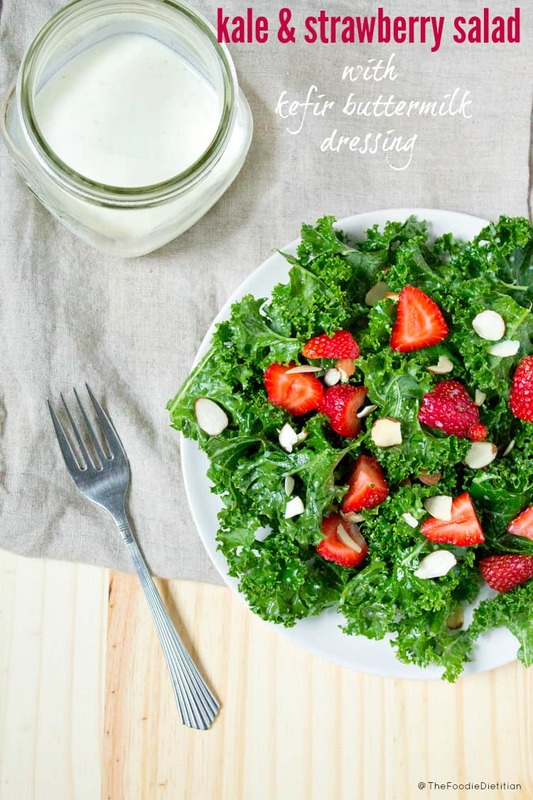 Love the idea of kefir in dressings or sauces! I’m not a huge fan of drinking it (texture thing), but certainly love the idea of adding extra probiotics to meals!